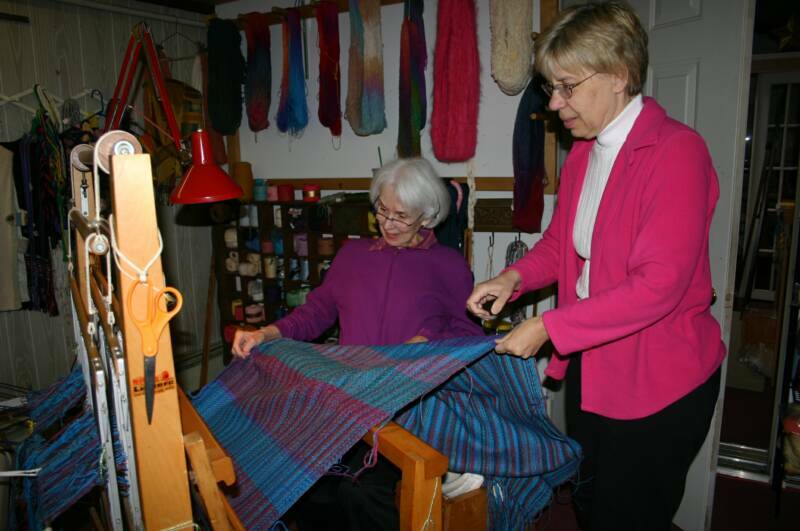 Cranberry Country Weavers' Guild is an organization of handweavers dedicated to the exploration and educational aspects of preserving the art of handweaving and other fiber arts and their relationship to weaving. 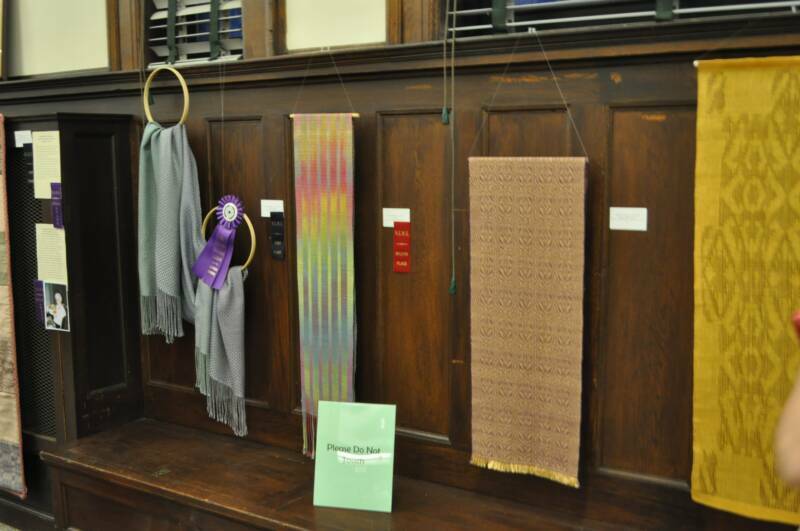 We welcome all interested in handweaving to join us! 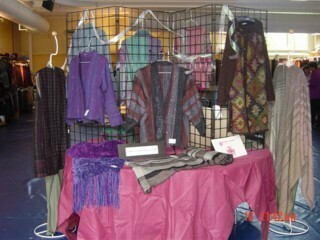 Our meeting place is the West Bridgewater Public Library, 80 Howard Street, in West Bridgewater , Massachusetts . 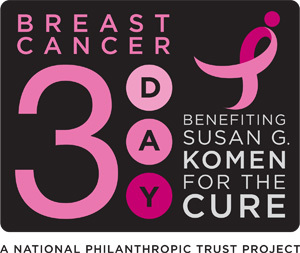 We meet the 3rd Wednesday of each month except for the months July, August and December. 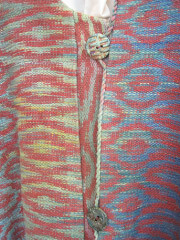 about a technique of handweaving or project. We meet from 10:30am- 2:00 ,sometimes, 3:00PM. Take route 24 south to exit 16A. Follow route 106 east for approximately 1.6 miles. is brick building on right. Park in front lot or left side lot of building. 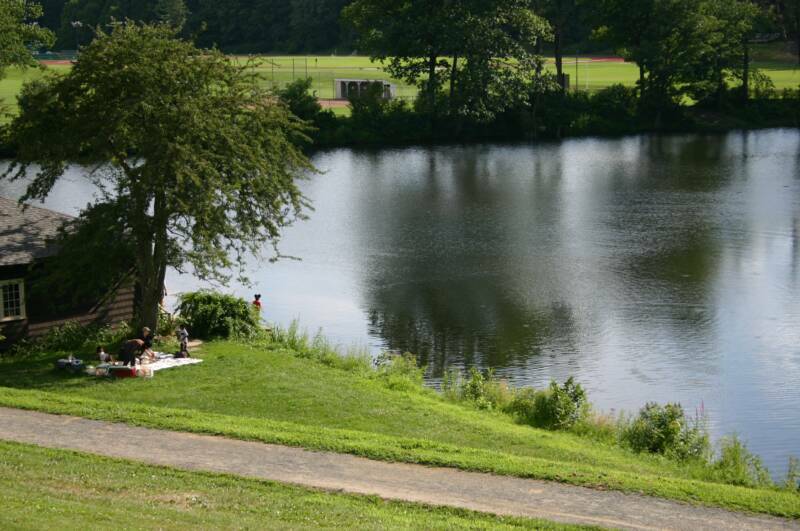 Take route 24 north to exit 16A Follow route 106 east for approximately 1.6 miles. and WBPL, #80 Howard St., is brick building on right. Rte. 495 to Exit 7 for Rte. 24 North. Take Exit 16A for Rte. 106 East into West Bridgewater. Pass through 1 set of traffic lights (at Hockomock Ctr.). Pass West Bridgewater High School on left. At blinking yellow light past High School, turn left onto Howard St. Follow curve to right, pass two houses and WBPL is brick building on right. Park in front lot or side lot of building. Turn left on to Howard Street (right after the Middle / Senior High). Follow Howard Street to 80 Howard St. Follow curve to right, pass two houses and WBPL is brick building on right. Park in front lot or side lot of building. Take route 28 north from Bridgewater to route 106 west. Follow route 106 west through the center of West Bridgewater. Turn right on to Howard Street (right after the Police and Fire Station). Follow Howard Street to 80 Howard St.
and proceed past WB Police station to blinking yellow light on 106 (before WBHS). Take a right on Howard St. The WBPL is around the curve on the right. 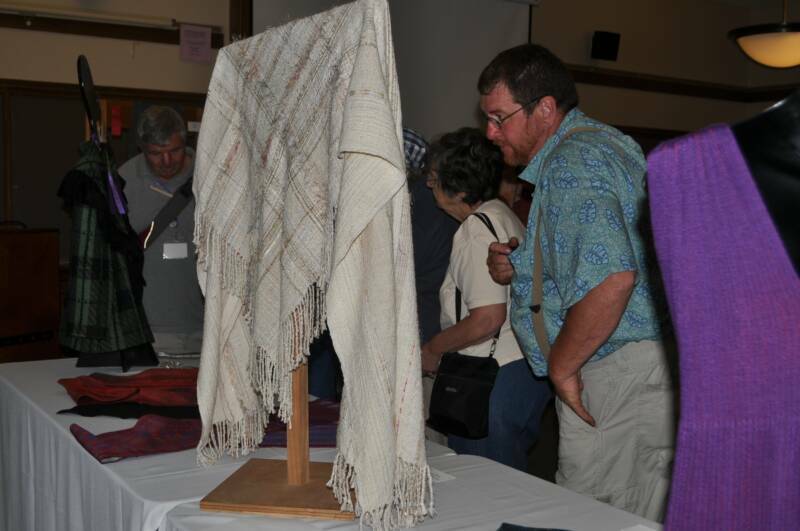 The Cranberry Country Weavers Guild is a contributing guild member of the New England Weavers Seminar held every two years. 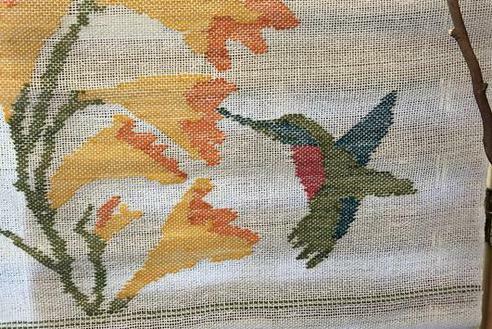 The New England Weavers Seminar will be held in July 2019 at Smith College in Northampton MA. 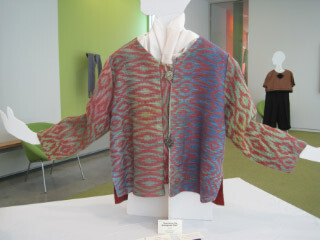 Photos of the guild's exhibits at the conference are below. 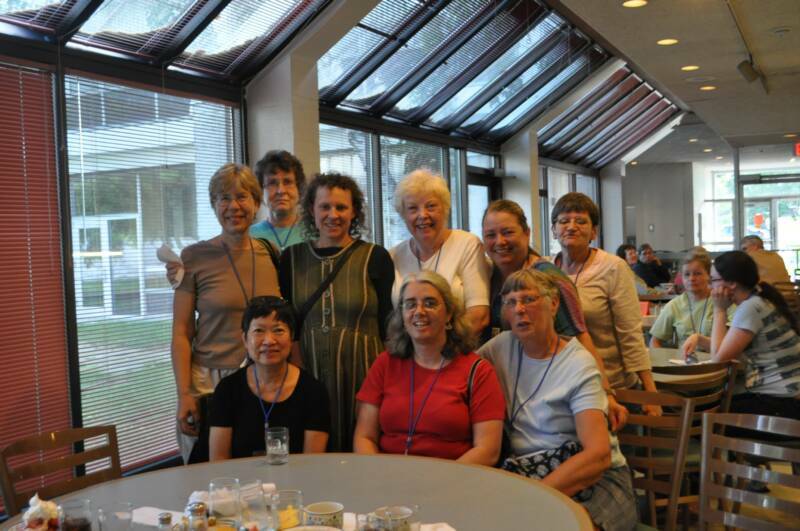 For more information about the New England Weavers Seminar Click the link button for N.E.W.S. The next NEWS will take place July 2019! 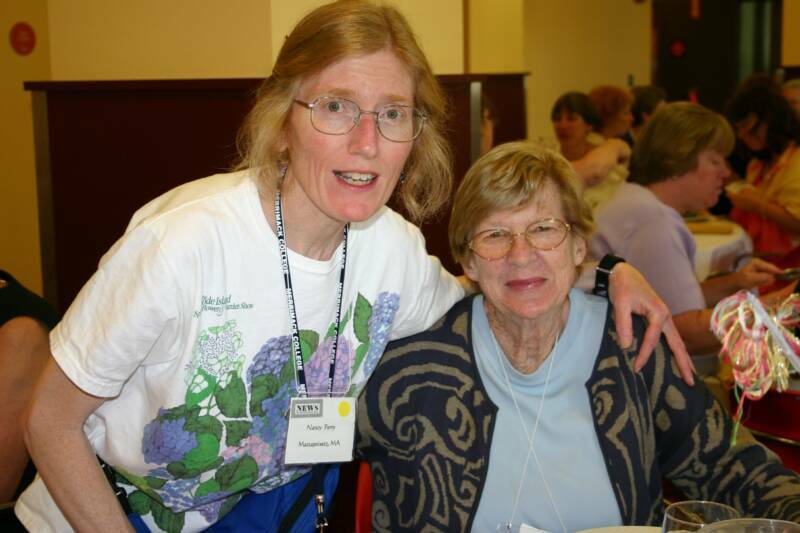 Betty passed away last year of ALS. 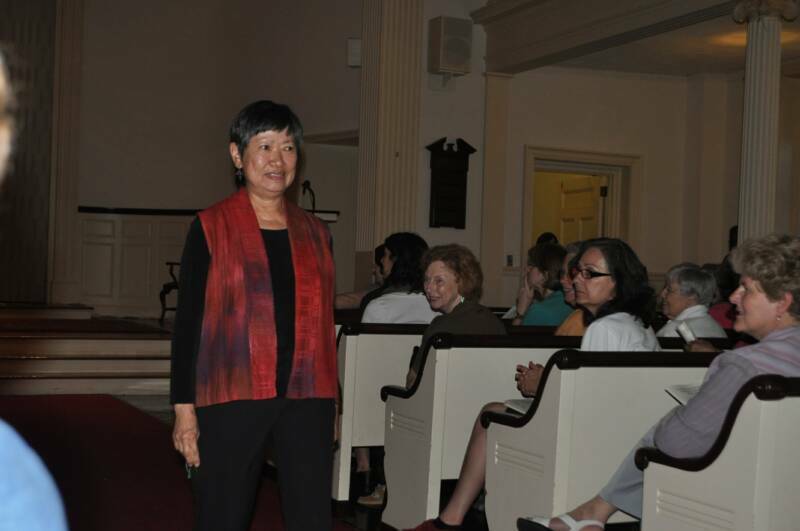 Ro, Nancy and Carol on the "runway". 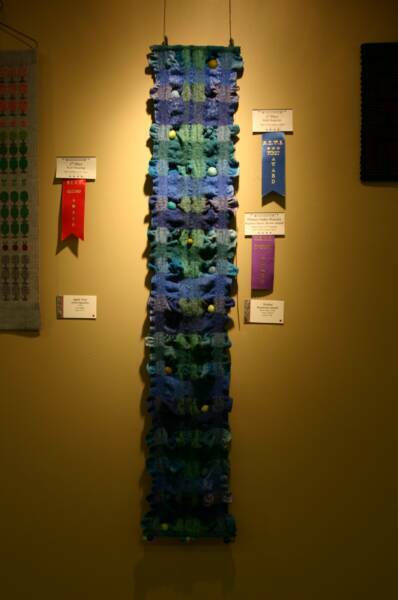 Cranberry's Guild Exhibit "Weaving GREEN"
West Bridgewater Public Library, 80 Howard Street, West Bridgewater,MA. Please park on the left-hand side of the building. As we create and find moments to weave, so many memories flood back into our minds triggered by songs and lyrics that defined an era in our lives. 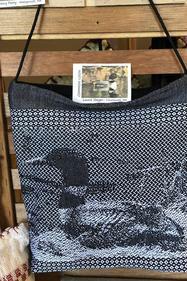 Please think back to your days in the year of the “Summer of love”, and find a song lyric that uses textile metaphors to evoke emotions. 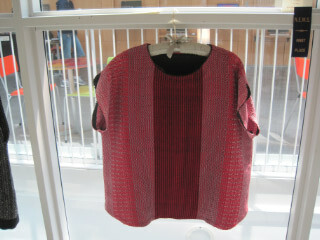 Use that idea as the springboard to weave a piece of textile imagery that describes your experience as a youth. Try to write a few words that relate to your “Younger Girl” days to include in a design/storyboard. 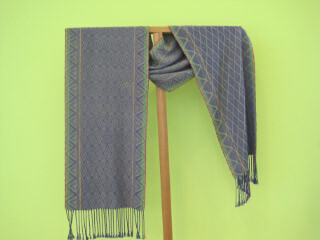 This Project may be interpreted in any weaving technique that you desire. 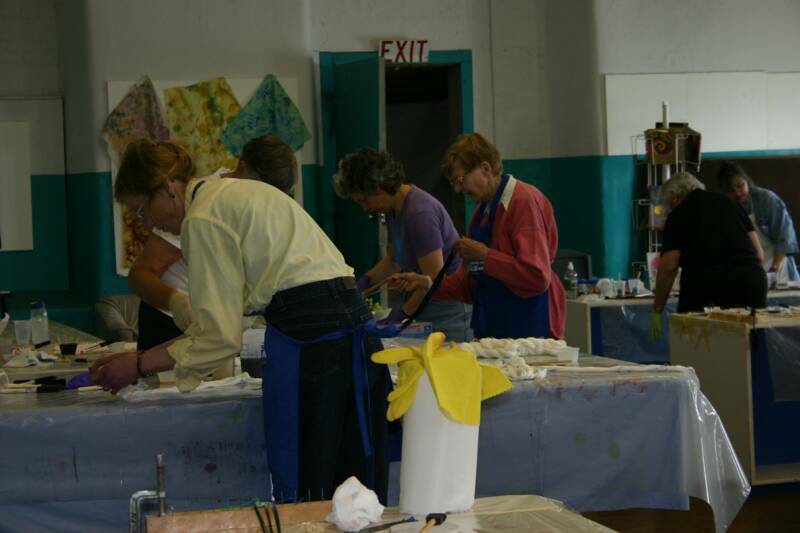 Emphasis is on developing design skills that translate to a personal storyline. The possibilities for a final presentation as an exhibition will be discussed with the members. 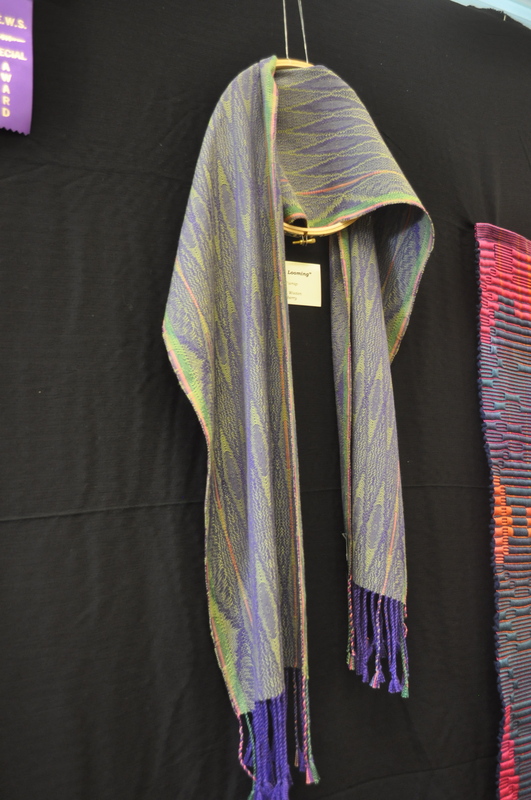 Laurie Carlson Steger is a fiber artist who has explored both traditional textiles and high-technology materials for textiles. 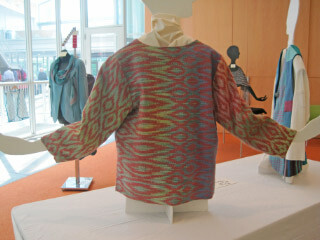 She earned her MFA /Fibers and BFA /Textile Design from UMass Dartmouth. 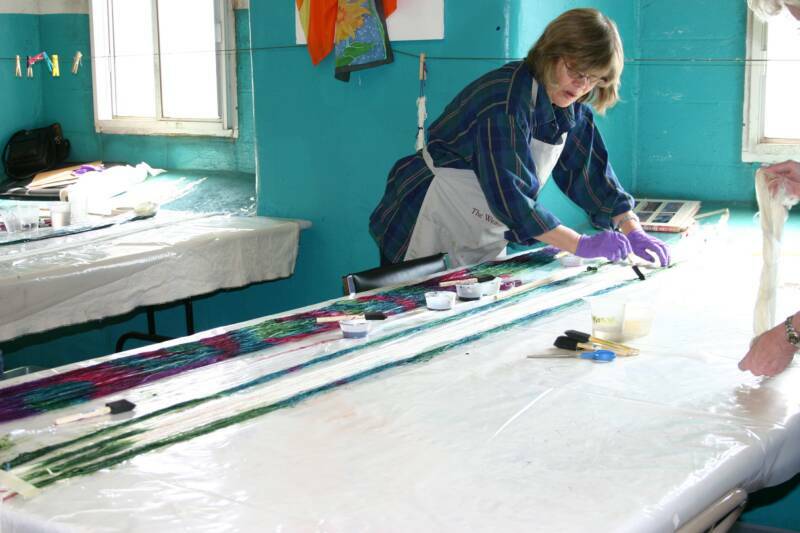 She has exhibited nationally and internationally and has presented or taught workshops for NEWS, HGA Convergence, Textile Society of America, Potomac Weavers Guild, San Diego Creative Weavers Guild, and Boston Weavers Guild, and RI. 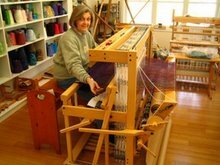 Linda Rhynard is owner of Kindred Spirits Creations, a studio dedicated to teaching spinning and weaving in Bristol, RI. 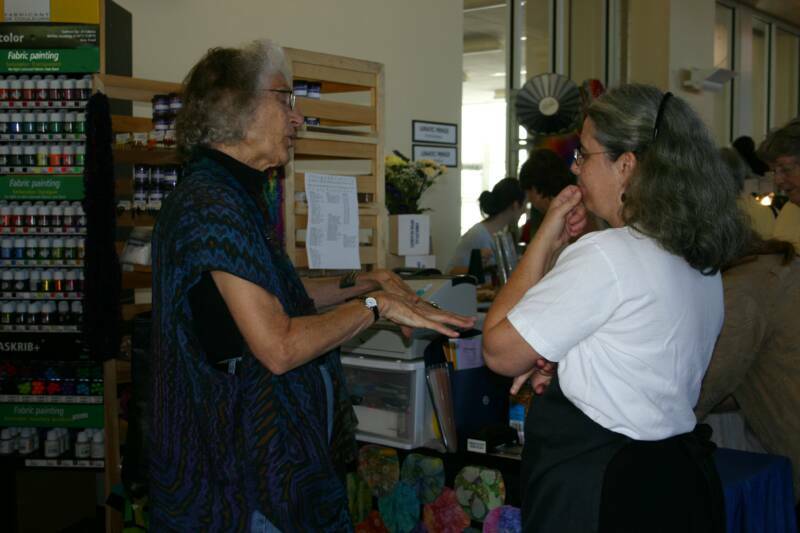 She is passionately engaged in Fiber Arts and teaching. 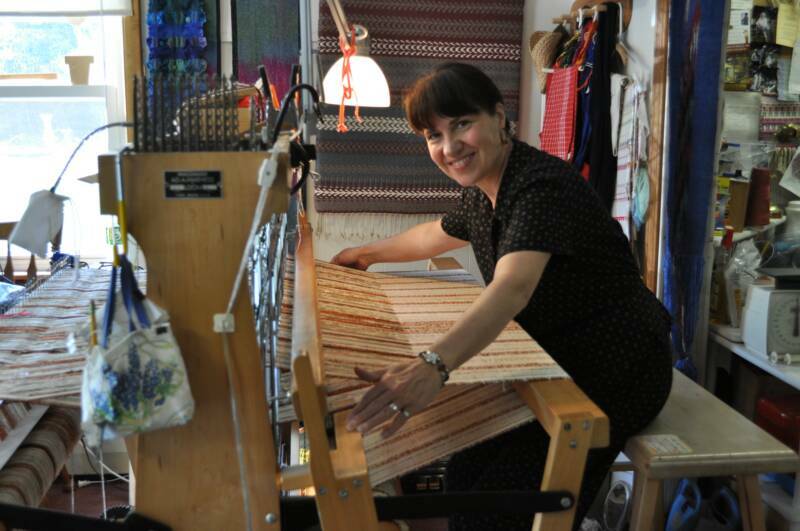 She is a certified “Weaving a Life “ Instructor. 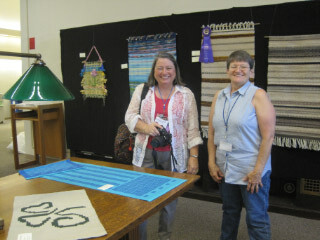 Linda is a member of the Cranberry Country Weavers Guild, Weavers Guild of RI, and Bayberry Spinners. 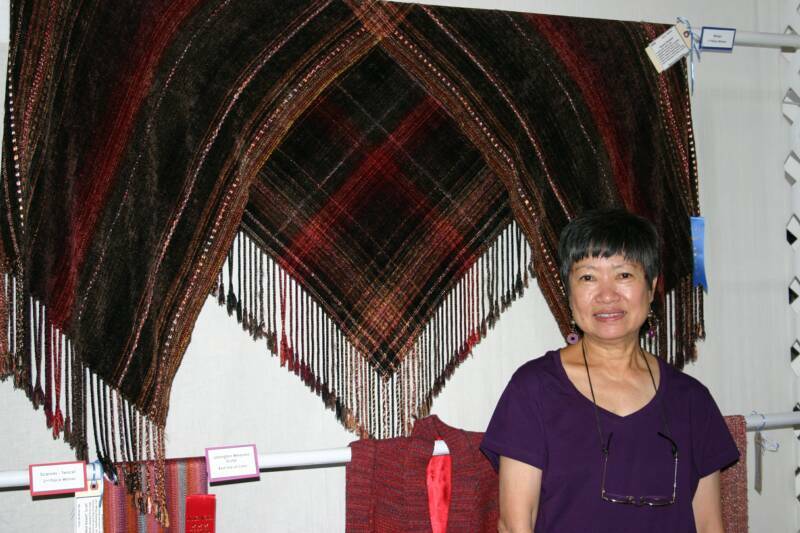 She teaches weaving at Museum Programs in the area. 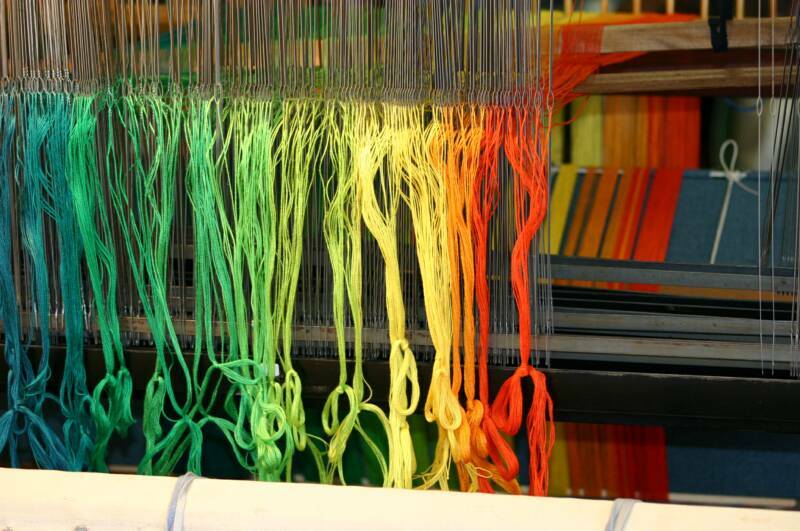 Weavers normally design on the grid, producing straight vertical and horizontal lines. 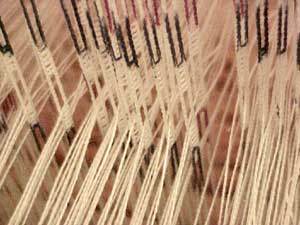 We can create curvilinear warp and weft effects with overshot designs and undulating twills, although the warps and wefts remain straight. For actual movement in the warp the fan reed is a truly amazing and beautiful tool. This reed is composed of sections of dents that fan out from top to bottom alternating with sections of the opposite dent configuration. 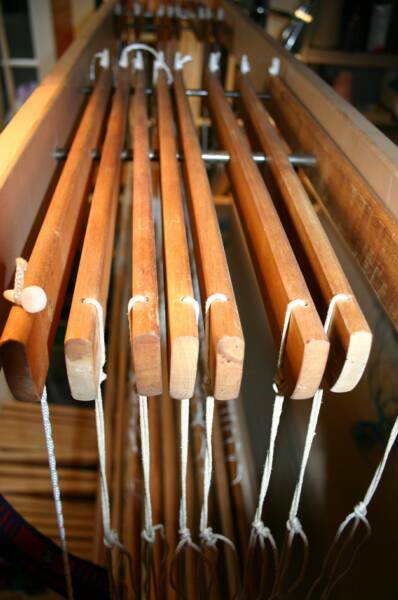 By weaving at different reed heights the warp ends move to create side-to-side vertical movement. 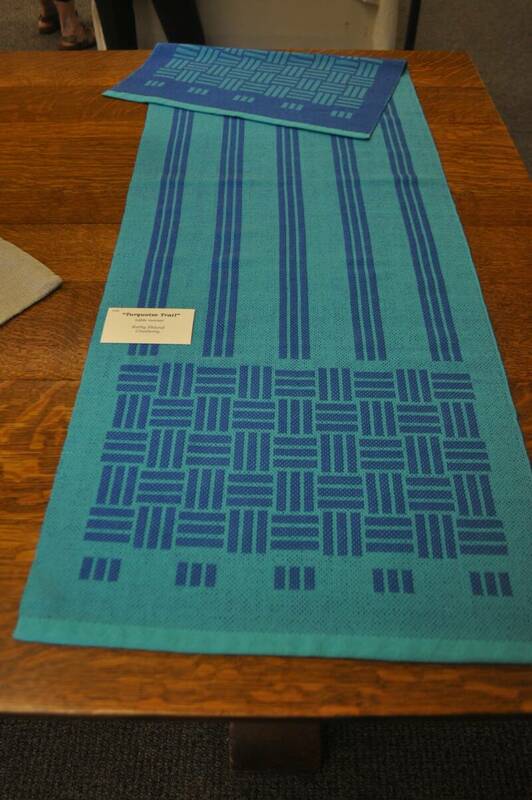 Ondulé textiles are suitable for scarves and shawls, table runners and wall hangings. 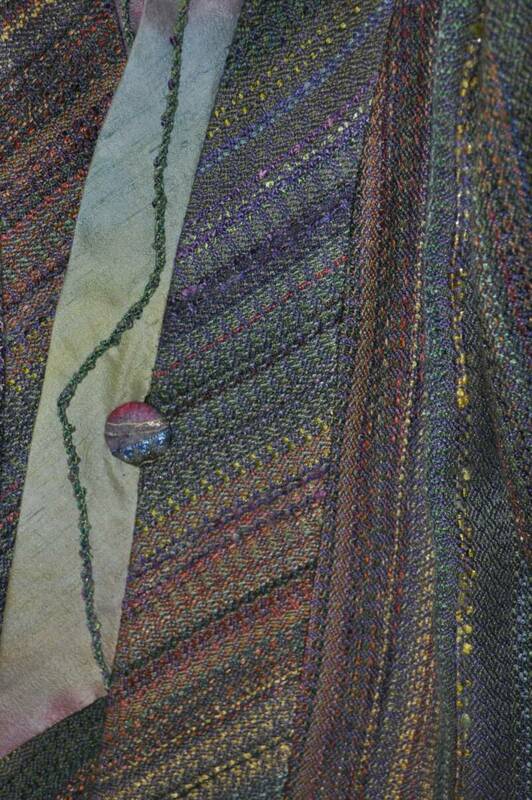 Color and weave structures effect the undulations caused by the fan reed. Examples will be shown. This is a Power Point presentation. 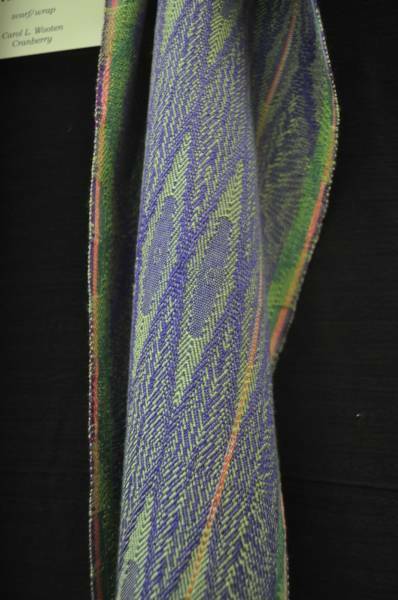 Copies of Ondulé Textiles: Weaving Contours with a Fan Reed will be available for sale. 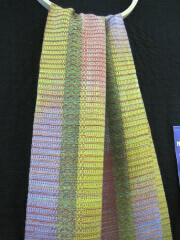 Norma Smayda is a weaver, teacher, exhibitor and juror, who learned to weave in Norway, and has returned there to teach. 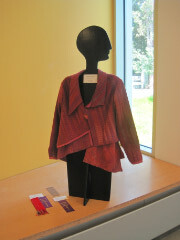 She has an MFA in Visual Design from UMass Dartmouth. 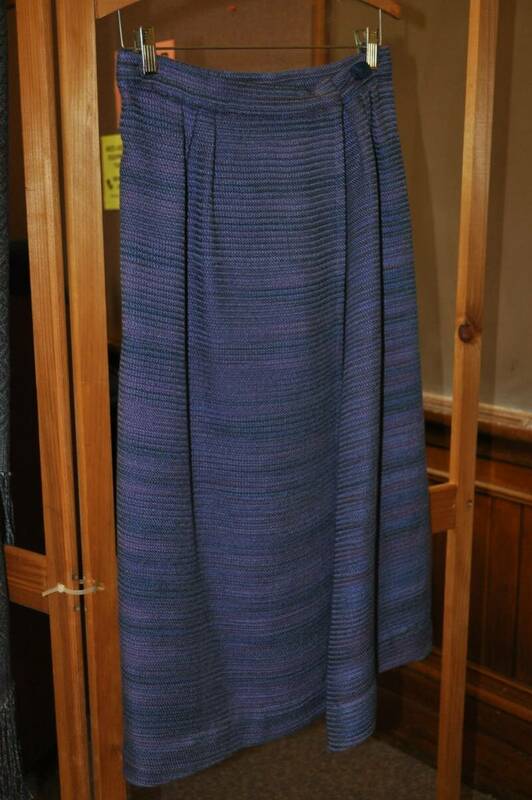 In 1974 she established and continues to run the Saunderstown Weaving School. 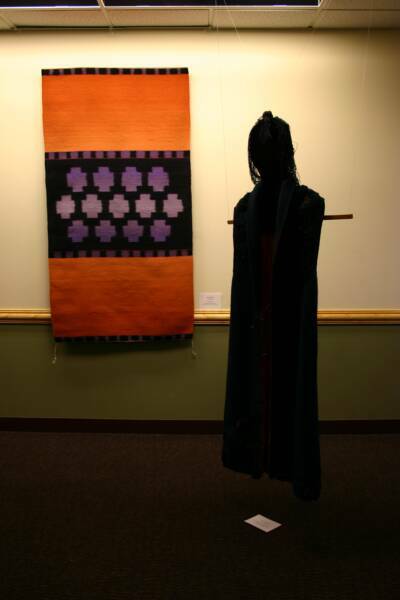 Her weaving and teaching has been inspired by Scandinavian textiles, and the works of Weaver Rose and Bertha Gray Hayes. 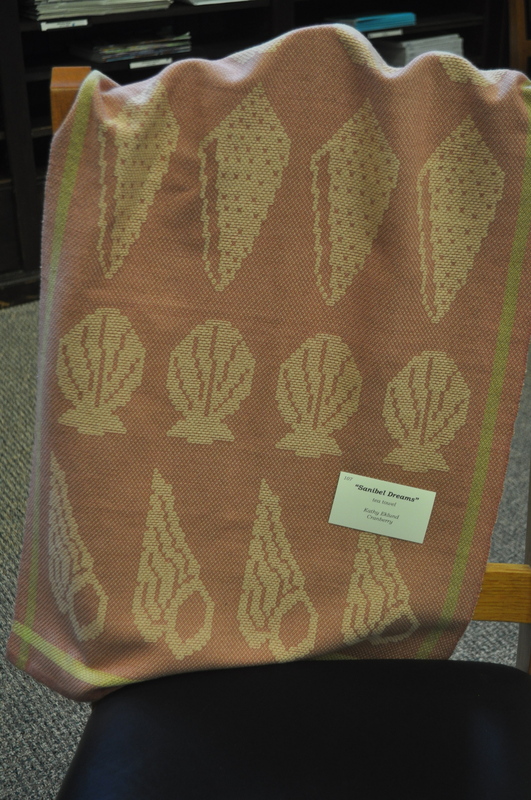 More recently she has immersed herself in weaving with fan reeds, and in exhibiting her ondulé textiles. 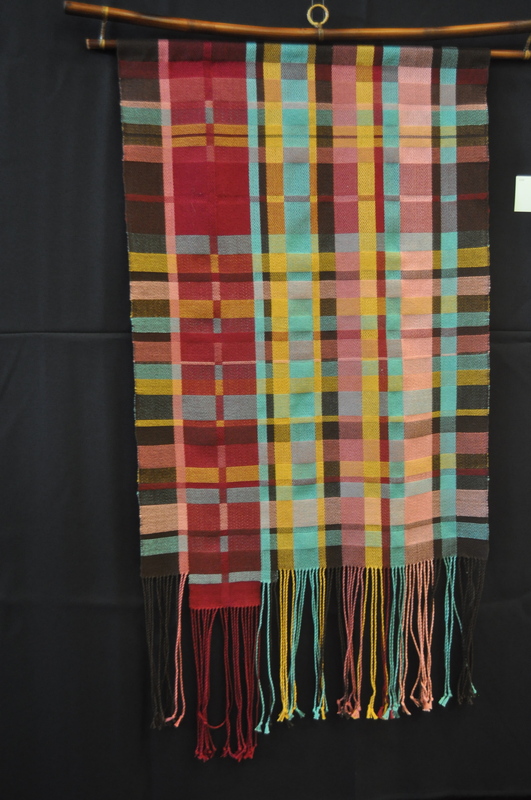 In 2009 she coauthored Weaving Designs by Bertha Gray Hayes, and in 2017 published Ondulé Textiles: Weaving Contours with a Fan Reed. 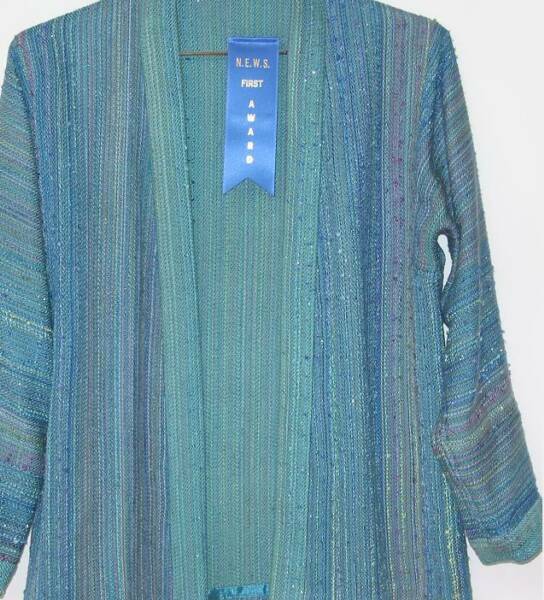 She has received the New England Weavers Seminar's Weaver of Distinction Award and the Weavers Guild of Boston's Distinguished Achievement Award. 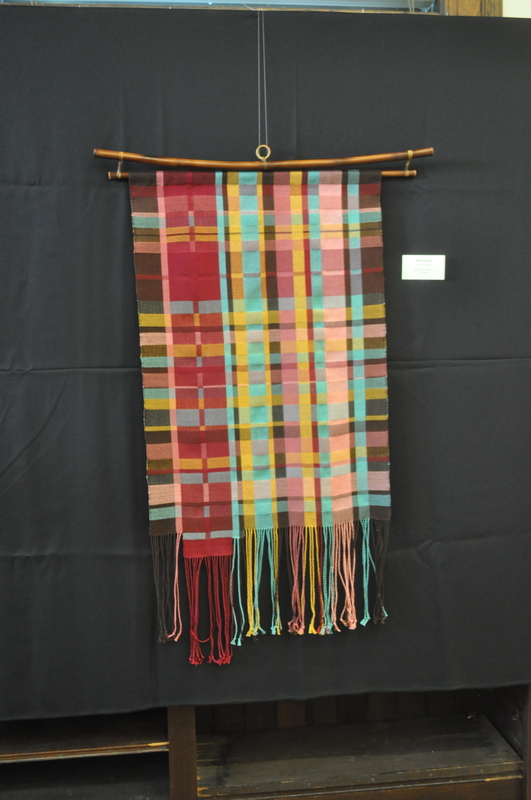 Susan Targove started weaving in 1998 as an escape from her office cubicle and eventually left the cubicle for a fiber studio. 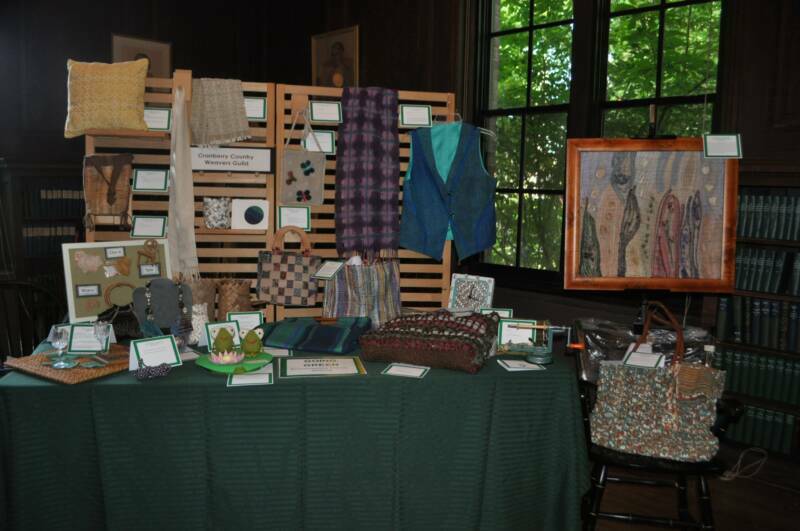 Completely unable to say no, she is a former Dean of the Weavers’ Guild of Boston and currently serves on the boards for the Boston guild, the Nashoba Valley Weavers’ Guild and the New England Weavers’ Seminar. She lives in Lunenburg with her engineer husband and two cats. All NEWS entries and Guild exhibition items should be brought to this meeting for the show and tell and forms should be complete. 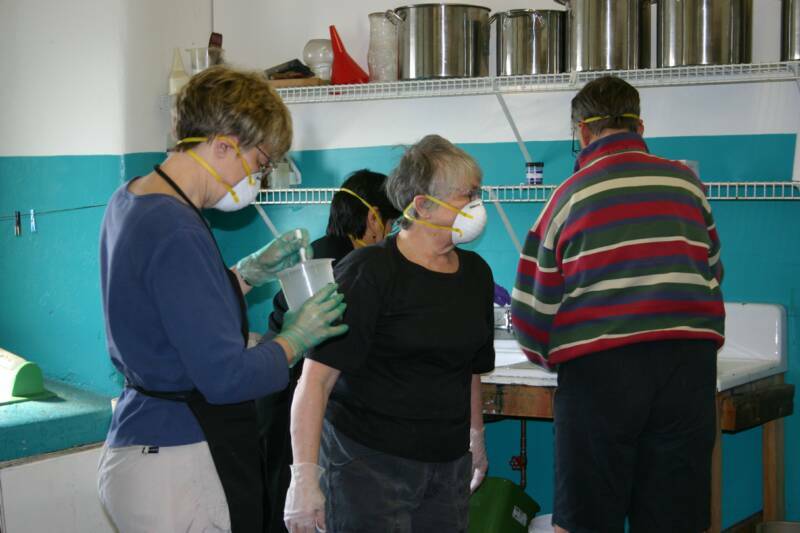 NEWS volunteer schedule established.